At the beginning of 2013 I embarked on a graduate program at the University of Queensland, specialising in GIS and Environmental Management. This program was funded by AusAID, Australian government funding that was intended to prepare me for my PhD studies at an Australian university. As a student, a large proportion of my time was allocated to studies which were a mix of theoretical classroom lectures and laboratory sessions for GIS and Remote Sensing courses. Australian assignments and classwork were interesting, especially the fact that contrary to most African education systems, where practical laboratory sessions are often a formality with little or nothing gleaned. Here, laboratory sessions were conducted in an excellent way with tutors who would assist the students in their learning. This ensured that students actually understood the important aspects of laboratory exercises. As a student, I worked as a tutor in undergraduate Environmental Science and GIS courses where I learnt a lot. I also had an opportunity to further my research whereby three abstracts of conference papers were accepted at conferences at the University of Queensland, Brisbane; at Murdoch University, Perth; and at Victoria University in Wellington, New Zealand. The topics of the papers were as follows: “Community-based natural resource management and sustainability of forest use in Uganda: Case study of Kibale National Park” at the University of Queensland; “Community-based natural resource management & sustainable forest resource use at Bwindi Impenetrable and Kibale National Parks, Uganda” at Murdoch University; and “Using GIS and Multi-criteria analysis for land suitability analysis for residential and conservation at Pinjarra Hills, Brisbane” at Victoria University. At these conferences I had opportunities to interact with scholars from different parts of the world and who remain influential in my life. I was also able to polish my writing and presentation skills which are vital to the upcoming PhD program. Besides classwork, I also had opportunities to engage in activities such as playing soccer, visiting friends, participating in organising activities for associations such as the African Students’ Association (ASA), GPEM mentor programs, and the Geography Club. As a student, I could not of course miss the weekly and weekend prayer meetings, the meetings in our apartments over the weekdays, and traveling for church services to St Lucia Uniting Church, Hillsongs church, and many more at Brisbane city. I also worked as a volunteer at Australian Conservation Foundation where I was involved in conservation activism, organising workshops and preparing funding proposals. The first job opportunity was working as a tutor at the UQ in semester two. This was a rewarding opportunity where I assisted undergraduate students in laboratory sessions involving image acquisition, interpretation and classification. I considered this a learning experience since remote sensing was one of the courses I was enrolled in. I was also privileged to secure work at one of the baking and coffee spots in Brisbane city namely Brewbakers at Albion. This was an interesting opportunity because I was able to learn how to bake cakes, prepare pizzas, sandwiches, make coffee etc. I was glad to work for humble bosses – Caroline and Richard – with Caroline in charge of sales and Richard heading the baking section. Surprisingly, it took me over three months before I realised that Richard was one of the owners of Brewbakers, owing to his humble character. During my time in Australia I should say I have learnt a lot from the numerous interactions in class and out of class which have shaped and continues to shape my future. Upon my return to Uganda in 2014, I resumed my work as a Lecturer at Kabale University where I was tasked with developing the GIS course which was to be developed into a Unit. During this time, I attracted two volunteers, Joseph Abrams and Adam McKay, from the USA and Canada, respectively. These two GIS experts were linked to me through Shoreh Elhami, one of the GISCorps co-founders, who is based in the USA. 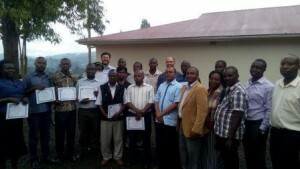 With the assistance from ESRI, a GIS vending company, ArcGIS 11.2 software licence and its extensions were donated to Kabale University for GIS teaching. In March and April 2015, the volunteers under my supervision participated in the training of 21 Kabale University academic staff, in addition to four academic staff of Bishop Barham University and two research fellows of Kachwekano Zonal Agricultural Research Institute (see photo below). It was a nice experience coordinating this volunteer training program, which I can say was a success. Unfortunately I could not work with Kabale University longer and by October 2015 I had left the University and started my career with Earth Consult Uganda Ltd, a GIS and forestry consulting firm. While working with Earth Consult I also had an opportunity to establish ACODEP (Advocate for Community Development and Environmental Protection), a NGO with headquarters in Wakiso, Hoima Road. AODEP is a community development and environmental management organisation with pilot projects in Wakiso District. The organisation so far has a team of five professionals specialising in Natural Resource Management and Community-income generating development projects. I am returning back to Australia for a PhD program in Civil and Environmental Engineering at the University of New South Wales, pending availability of the necessary funding. My PhD project has the working title “Climate change adaptation and vulnerability assessments: Implications for farmers and pastoral communities in dryland areas of Nakasongola district, central Uganda”. Since my return I have been working on academic manuscripts for publishing in referred journals with support from my supervisor. So far, three papers have been submitted for publication. In summary, I am very thankful to the Australian Government for the generous funding provided for the pre-Doctoral studies that I was undertaking. Acknowledgement also goes to the UQ Academic staff, AusAID staff and the Ugandan community in Queensland.